If you’ve ever wished you could create advanced, automated interactions between all the smart devices in your house, Stringify is your new best friend. With it, you can have multiple devices turn on or perform actions when certain conditions are met. 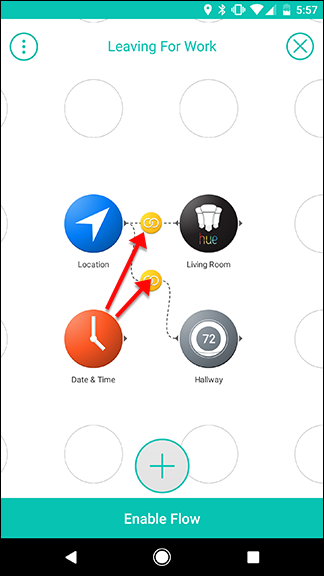 Stringify works along the same principle as the ever-popular IFTTT. IFTTT has some pretty frustrating limitations. It can only use one trigger to activate one action at a time, for example. Stringify is more powerful, letting you activate multiple actions, activate actions only if multiple conditions are met, and overall create more complex interactions. 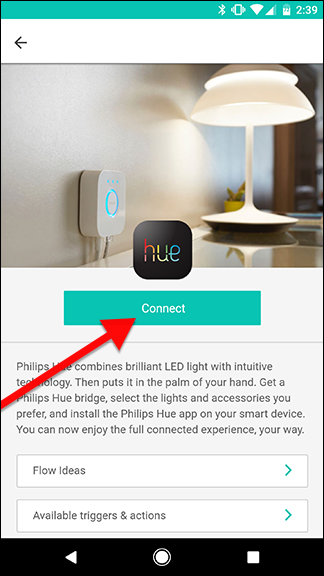 The basics are similar, though: You connect your various accounts and devices like Alexa, Google Assistant, or Philips Hue lights to Stringify. 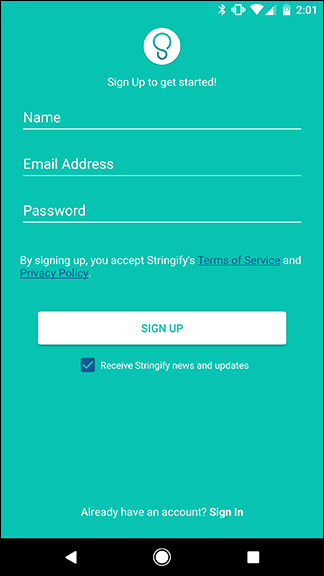 Stringify calls these your “Things”, and you can see a list of supported Things here. Once you connect your Things, you can create programs called “Flows” that perform actions based on certain conditions. For example, you can tell Alexa “good morning” to have Stringify turn on your lights, or send you a weather report. It’s more powerful than that, though. For example, you tell it to only turn your lights off when you leave in the morning. Stringify can accept several conditions and do multiple things at once, unlike IFTTT. So, for example, this Flow activates when you leave work, but only if you leave after 5PM. It then checks how long it will take you to get home and sets your Nest thermostat to have your home ready by the time you get there. This is still pretty simple, but because it requires two conditions and two actions, it’s too complex for IFTTT. 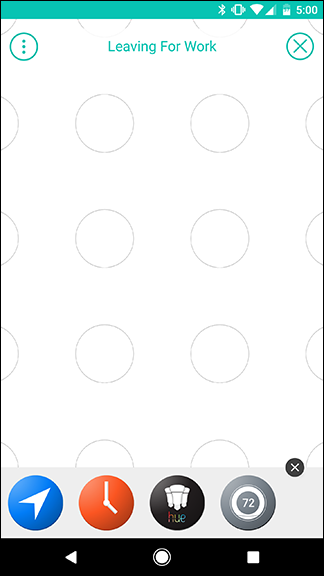 There is one minor downside to using Stringify: It’s mobile-only. To get started, download the app for Android or iOS. When you first open the app, you’ll need to create an account. Enter your name, email address, and create a password, then click Sign Up. You’ll receive an email asking you to confirm your account. Click the link in the email, then sign in on your phone. 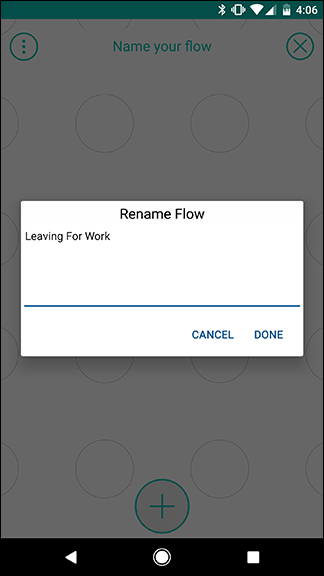 Now, you’re ready to get started creating your own Flows. 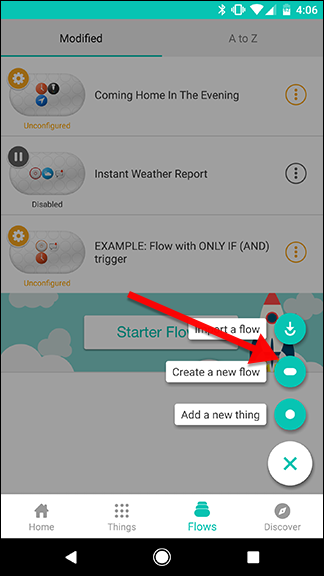 As we mentioned earlier, Stringify works by connecting your Things to create Flows. It’s all very technical terminology. First, you’ll need to get some Things. You can browse a list of compatible apps and devices here. To connect your Things, open up the app and tap on Things along the bottom. 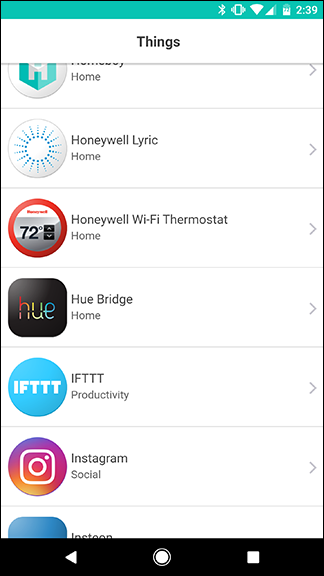 Scroll through the list to find the devices or accounts you want to connect, like your Hue lights or Alexa. 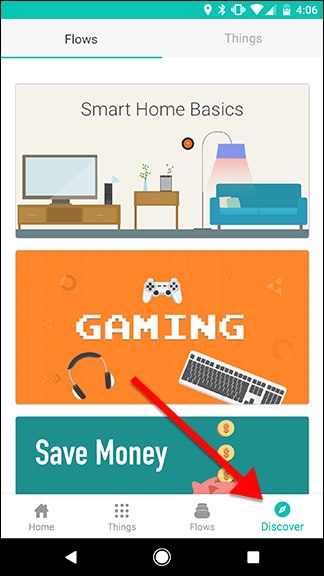 Tap the Connect button to log into your account. Repeat this process for other Things in your house. Once you’ve connected a few Things, you can start stringing them together. Once you’ve connected all your devices, you can start creating your own Flows, or you can activate some that are already made for you. 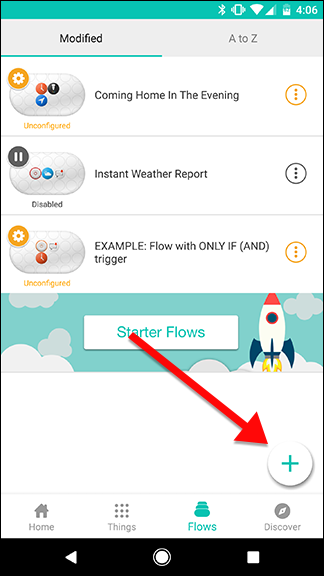 To browse Stringify’s existing Flows, open the app and tap Discover in the bottom right. 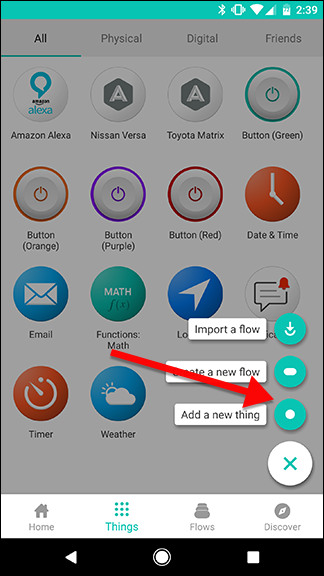 When you find a Flow you like, you can tap Get Flow to activate it for your account. Of course, you probably want to create your own Flows. To demonstrate how to do that, we’ll create a Flow that sets our Nest thermostat to Eco mode and turns off our Philips Hue lights whenever we leave home, but only during the morning. 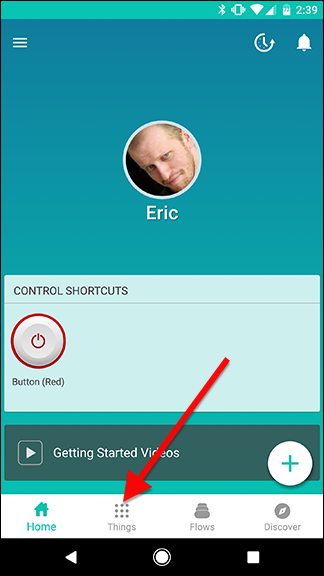 To get started, open the app and tap Flows along the bottom bar. 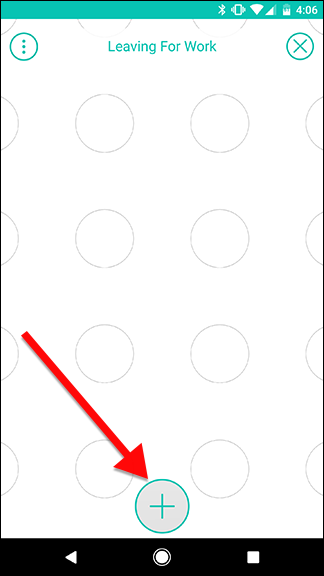 Next, tap the plus icon at the bottom of the screen. Select all the Things you’ll need for your Flow from the list. This will add them to your workspace, where you can drag them into place. You can select all of the Things you need at once, or you can do one at a time. For this Flow, we need four Things. Date & Time, the Philips Hue light in question (in this case, I’m choosing the Living Room scene), Location, and our Nest Thermostat. 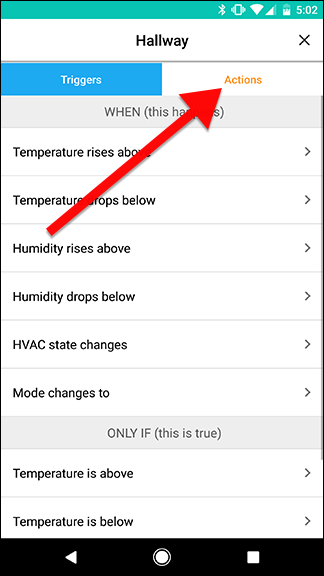 Note that you’ll want to choose the thermostat itself (mine is named Hallway), not the name of the home, which is a catch-all thing for several Nest devices if you have them. You’ll now see all of your Things in a little “shelf” along the bottom of the screen. You can drag these out onto the grid of circles above. 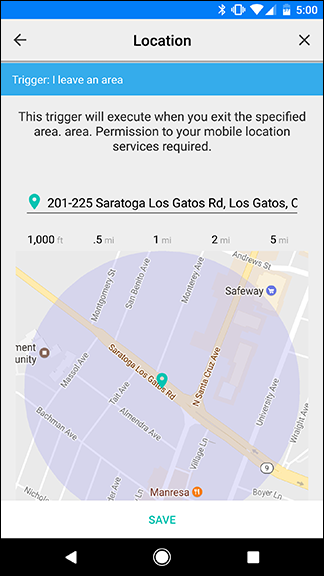 To get started, drag Location onto any empty circle. This will be your primary trigger, which Stringify refers to as a WHEN trigger. Tap the gear icon peeking from behind the Location icon. 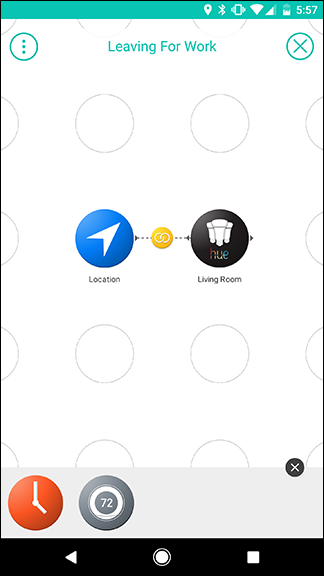 Tap “I leave an area” to set your Flow to activate whenever you leave home. Enter your address in the search box and find your home on the map thumbnail below. 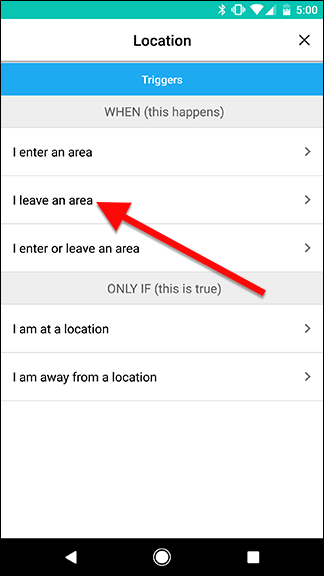 You can change the radius of the geofence around your home, if your address is less precise. From this point on, where you place your Things will matter. Generally, triggers go on the left and actions will go to the right. So, for example, let’s say you just want to turn off your living room light when you leave home. The Location trigger will go on the left and the Hue action will go on the right. Let’s set that up first. 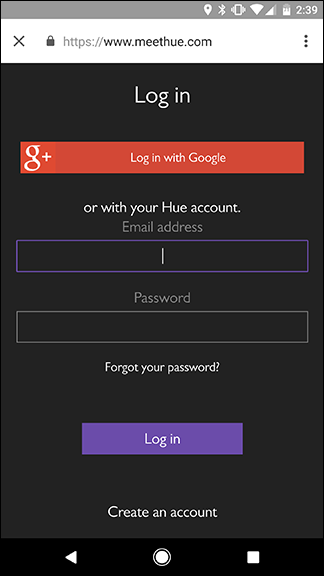 Drag your Hue Thing to the grid directly to the right of Location, then tap on its gear icon. 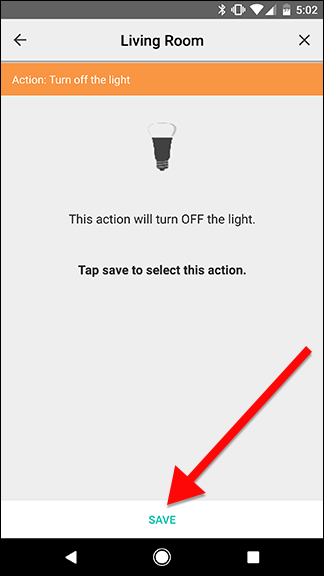 In the list of actions, tap “Turn off the light.” Then tap Save on the next screen. Back on the Flow grid, quickly swipe from the Location trigger to the Hue action. This will create a yellow link between the two. This is how you combine Things to create Flows. 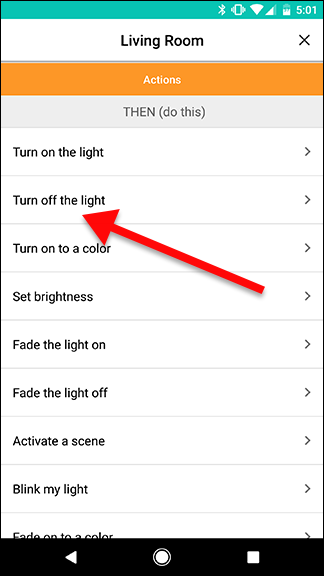 In this case, when you leave the area in the Location trigger, your Hue lights will turn off. This is a very basic, trigger-action Flow. Of course, we want to make things a little more complex. Next, we’ll add the Nest action. 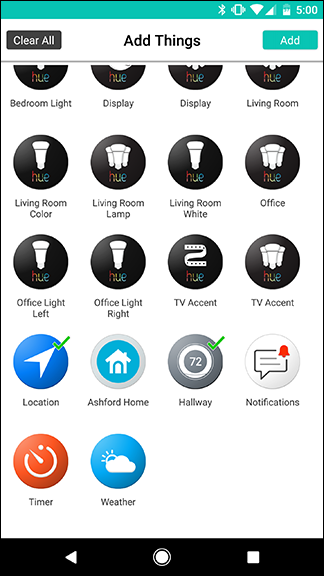 Drag the Nest Thing from your shelf to the grid directly below the Hue action. Remember, you can tie several actions to a single trigger, but they all need to be to the right of their respective trigger. 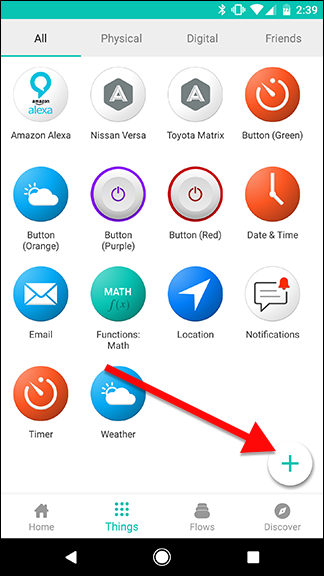 Once you’ve placed the Nest action, tap its gear settings icon. 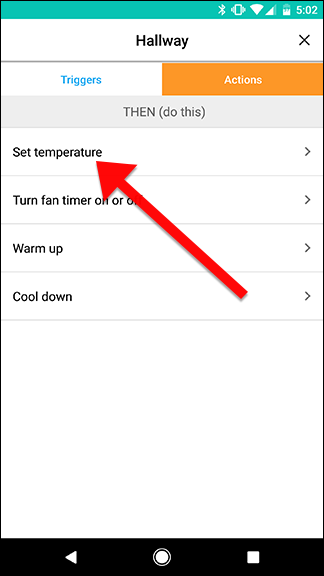 At the top of the screen, tap the Actions tab and choose “Set temperature” from the list. Choose Eco mode from the list of options. 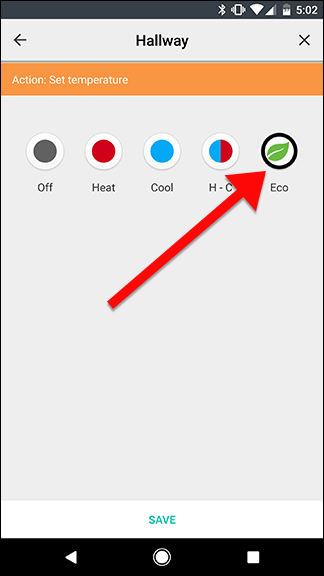 This will use your pre-set Eco mode temperatures, which you can adjust in the Nest app. Tap Save to finish. 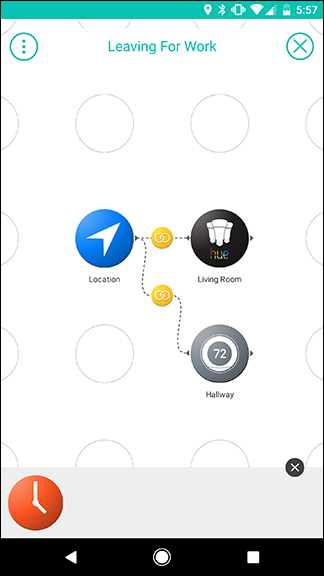 Back on the Flow grid screen, quickly swipe between the Location Thing and the Nest Thing. This will create a second link. 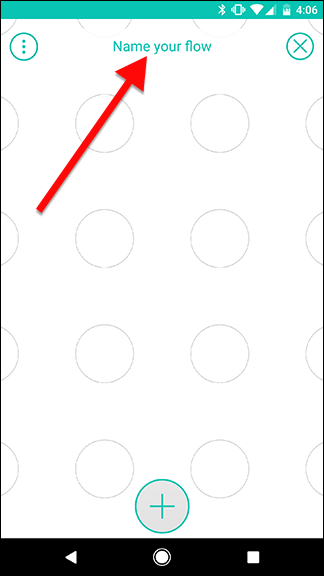 Now, when you leave the area in the Location trigger, it will activate two actions. Your lights will turn off and your Nest will be set to Eco mode. Finally, we’ll add a conditional trigger so that this Flow will only activate in the morning. You don’t need your lights and thermostat on when you leave for work, but you don’t want to turn your thermostat off when you run to grab some fast food or something, right? Of course. So, we’ll add the Date & Time trigger directly below the Location trigger. The Date & Time trigger we’re going to use is referred to as an ONLY IF trigger in Stringify. You can only use one WHEN trigger, but you can have as many ONLY IF triggers as you want. Since this is a trigger, it should be to the left of your actions, so you want it below Location. Tap the gear icon once it’s in place. 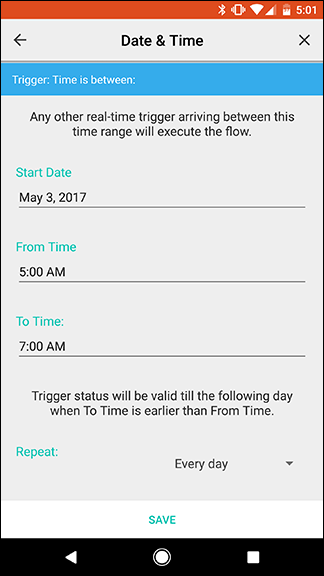 On the next screen, choose the hours you want to restrict your Flow to. In my case, I’m setting this Flow to only activate between 5:00 AM and 7:00 AM every day. Tap Save when you’re finished. The next step is a little quirky due to the way that Stringify handles creating links. In order to tie the Date & Time trigger to your existing links, you want to drag from the Date & Time thing to the yellow link icons representing each action. The image on the left shows where you should drag your finger. When you’re finished, your Flow should look like the picture on the right. 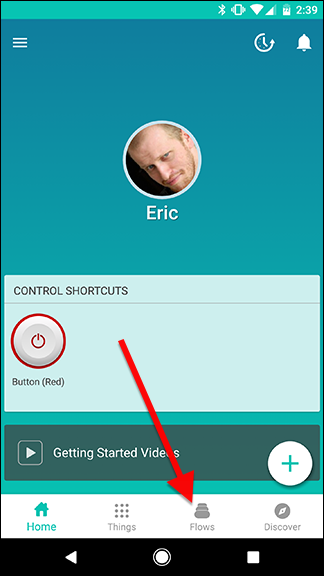 When that’s done, tap Enable Flow at the bottom. Very frustratingly, Stringify doesn’t allow you to edit links if you mess up, so make sure you plan out the logic of your Flows before creating them. 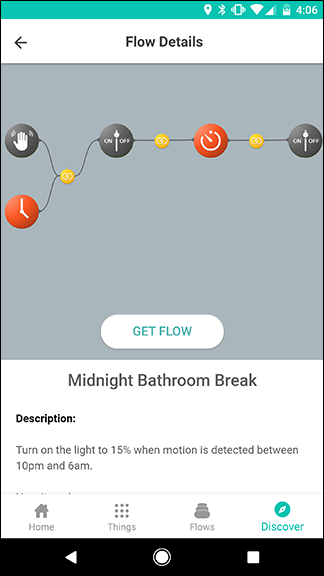 For example, in this Flow, you could set it up so that when you leave the house, the lights always turn off, but the Nest thermostat only turns off if you leave in the morning. 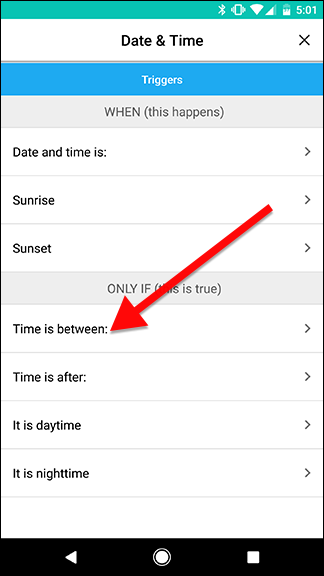 To do that, you would drag from the Date & Time Thing to the yellow link between Location and Hue. However, if you miss and apply the Date & Time condition to the Nest action, then you’ll have to remove the Nest Thing and re-add it in order to remove the Date & Time condition. You can learn more about how Stringify’s Flows work and how to structure them here. If you’re used to IFTTT, Stringify will take a little bit of getting used to. Its interface isn’t quite as obviously intuitive as IFTTT, and it can take a little trial and error to get things working properly. However, once you get the hang of it, Stringify absolutely schools IFTTT in complexity. It allows you to do a lot more with simple instructions. Play around with everything and explore the Flows that other people have created to see what you can do!